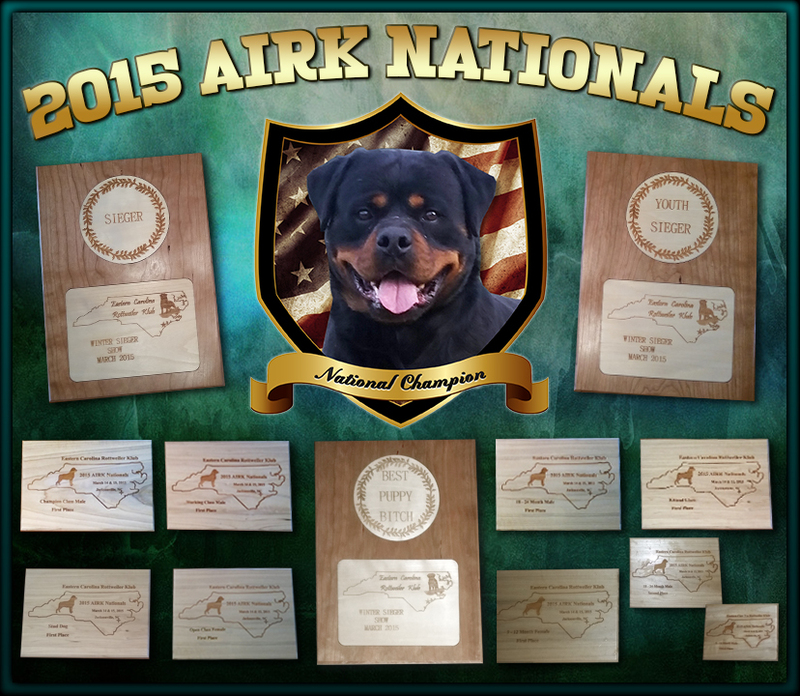 Welcome to Von Herrschaft Rottweilers, a rottweiler kennel based out of Front Royal, Virginia. We are home of rottweiler stud Tito Earl Antonius and world champion Gonzzo Earl Antonius. Gonzzo Earl Antonius has won Top German Stud Dog at the ADRK Klub Show. Tito Earl Antonius is the best producing rottweiler male stud dog in the world. We feel that the rottweiler female is just as important as the rottweiler male in breeding the superior rottweiler dog. Our foundation rottweiler female, Akira Elez Rott, was three times vice world champion, two time US National Champion and has produced multiple young and adult national winners , Sieger and Siegerin rottweiler dogs. Tito Earl Antonius, Gonzzo Earl Antonius and Arko Earl Antonius are our rottweiler stud dogs that have continuously produced top show quality rottweiler dogs. Our rottweiler kennel has produced top quality rottweiler dogs throughout the US, South America, Europe and Australia. In 2014, Lili Earl Antonius won ADRK World Youth Winner and BOB. Tito Earl Antonius progeny also won VDH Europasiegerin, Diva Earl Antonius and VDH Europasieger, Noddy Futogline. 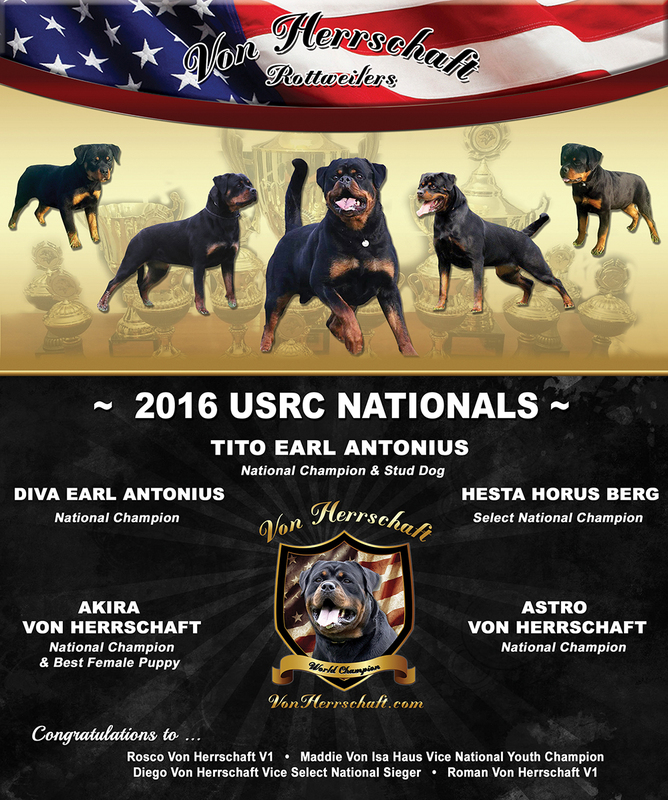 Tito Earl Antonius was imported in 2013 and he was V1 rated at RKNA DVM Show and at USRC Nationals. Tito also went on to win the title of 2013 USRC National Sieger and his first progeny from Von Herrschaft were all VP rated. 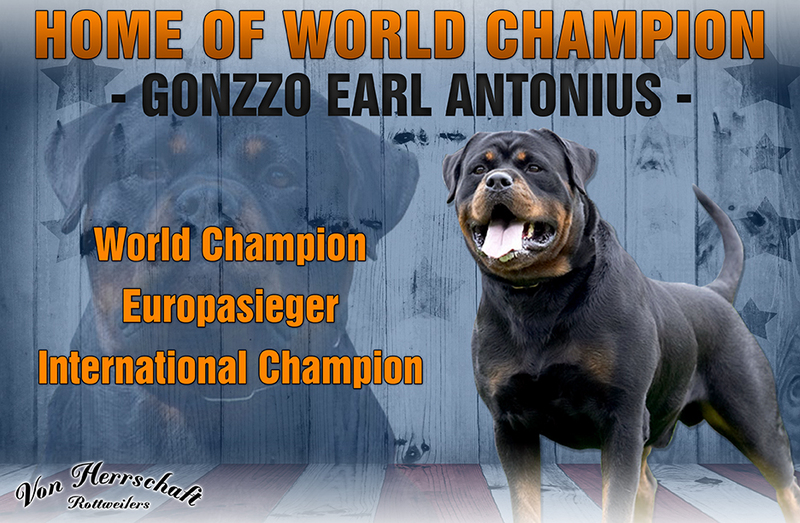 There is a short break from showing from 2011-2013 to due the passing of World Champion, Gonzzo Earl Antonius. Gonzzo produced multiple v-rated male and female rottweilers including such prestigious titles as World Champion, Vice World Champion, Auslandsieger and Auslandsiegerin. He was legendary in the breed. In 2010 we showed our Gonzzo Earl Antonius offspring at the RKNA Nationals. Freekey Von Herrschaft was rated VP1 in the 6-9 month class. Gladiator Von Herrschaft was rated VP1 in the 6-9 month class and and Best Male Puppy. Gonzzo Earl Antonius was World Champion for the third time in 2009. He was also V1 working class and USRC National Champion. In 2008 we traveled to Argentina for the IFR World show with Gonzzo Earl Antonius and Akira Elez Rott. Gonzzo won World Champion and also CARIB’s American Champion. Akira was V1 rated in her class and won Vice World Champion. 2007 was a great year for Von Herrschaft Rottweilers. We went to Italy for the World Show. We took first place with both Arko Earl Antonius and Gonzzo Earl Antonius . On to the 100th ADRK KLUBSIEGER SHOW Gonzzo Earl Antonius goes V4 in the working class. Gonzzo was in the ring with Arzadon Tayson who is Tito’s sire. Placing in the top four at this prestigious show is quite an honor to the owner, breeder and rottweiler. Gonzzo Earl Antonius also won the best german stud dog which means his progeny were the best. The IFR World Show in Mexico City in 2006 was an outstanding showing for Von Herrschaft Rottweilers. Apollo Earl Antonius, a Gonzzo son, was V1 and vice world champion. Nera Earl Antonius, a Gonzzo daughter, was V1 and world champion. Akira Elez Rott was V1 and vice world champion. Gonzzo was V1 and world champion. Gonzzo and Nera ran for the title of Best of Breed and Nera beat her father for the title of BOB!! 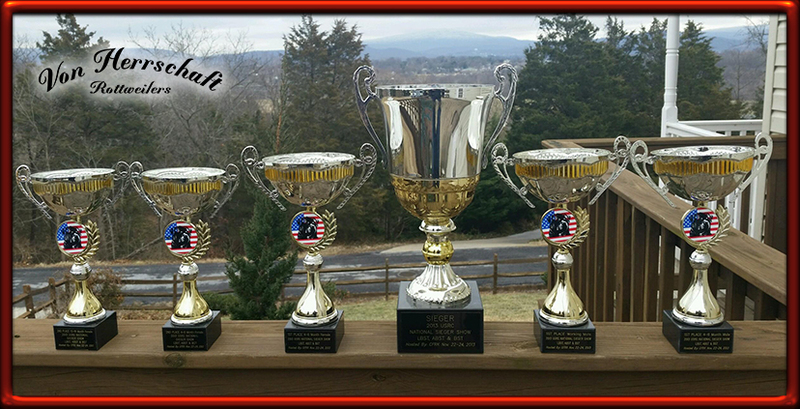 Then there was the USRC Nationals were Akira Elez Rott was V1 and National Champion. Gonzzo Earl Antonius was V1 and National Champion. We also won best female puppy, Stud Dog with Gonzzo and Von Herrschaft Rotweilers won best kennel. In February 2005 we purchased Gonzzo Earl Antonius to better our bloodlines. Three days after his arrival to the USA, Gonzzo was rated V1 at the Central Florida ARV Show. After that we took Gonzzo and Akira to the IFR World Show in Argentina. Gonzzo Earl Antonius and Akira Elez Rott were famous at that show. All competitors knew these superior rottweilers, their titles and their progeny. Gonzzo was rated V1 every day during the show. Akira was also rated V1 every day and she also won Vice World Champion. In 2004 we purchased Kliff vom Schwaiger Rathaus from Xavier Meixner in Germany from the famous Schwaiger Wappen Rottweiler Kennel. Kliff has many working titles such as SCH3, IPO3, FH and AD. He also won the German and Austria Budensieger. Kliff had very high drive and temperment which produced great working dogs. We also imported Akira Elez Rott bred to Gonzzo Earl Antonius during 2004. Akira was rated V3 at the Budensieger, V2 at the Europasieger and V4 at the ADRK Klubsieger. The progeny from this breeding was our “R” litter. The littermates from this breeding always were V rated and place 1st, 2nd, 3rd and 4th at every show. This breeding was the reason why we imported Gonzzo Earl Antonius the following year. In 2003 we imported Monika Crni Lav who was a Rick von Burgthann daughter. Monika won the ARV Nationals in California under Bianca Miksiv, Croatia. We also imported Meggi Slaska Gwara, Akino vd Lauderbruke daughter to breed to Racker and expand our rottweiler bloodlines. Vamp vom Wolfert Turn was the next female to be imported because she was an Akino vd Lauderbruke bred to Antje vd Teigerfleise. In 2002, Racker Vom Weissen Schwan won the USRC Nationals under Gerard Apel and the ARC Reserve Winner under Catherine Thompson. We then took Racker Vom Weissen Schwan to the ADRK Klubsieger show. Racker was shown in the Champion Class and was V rated by Gerard Apel.. At the Klubsieger Show we bred Kimba Slaska Gwara to Mambo to Crossener Ranch to produce Von Herrschaft “G” litter. At the end of 2001, we purchased Racker Vom Weissen Schwan, a Rick vom Burgthann son, who produced multiple v-rated rottweiler dogs. Racker was an exceptional male rottweiler who bettered the breed. In 2000 we purchased our first male rottweiler, Haardy Cerny Panther. 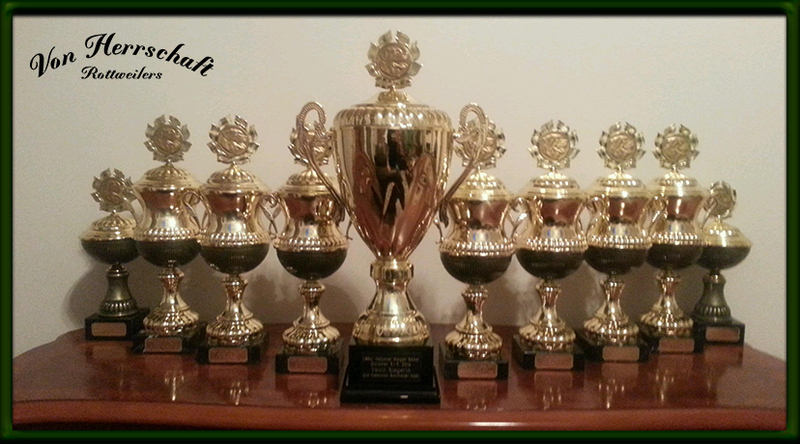 Haardy was Czech Junior Champion, IPO3, FH, AD, Korung and 2001 ARV Vice National Champion. Also, at the Nationals Aaron put the ZTP working title on Fee vom Minister Stein. All these years of results weren’t possible without the great people we met throughout the years with a little bit of luck thrown in too. We hope you enjoy the rottweiler breed as much as we do.